I’ve always loved old Valentine’s Day cards. Although I like all old cards, including very early ones, mid- to late-20th century Valentine’s Day cards are some of my favorites. I wish I could find one of the large books of pages of valentines you could cut out and give to your teacher and fellow classmates, like they had when I was a kid. I remember feeling bad that my parents wouldn’t buy the pre-cut valentines (they cost more), but today I would love to have one of those large books with their pages and pages of different Valentine’s Day greetings. Photo: Valentine’s Day card from 1947. Credit: the Houston County, Tennessee, Archives. Some of these can be viewed on the Flickr account for Johns Hopkins University Library Special Collections (https://www.flickr.com/photos/tags/elizabethcobbold). 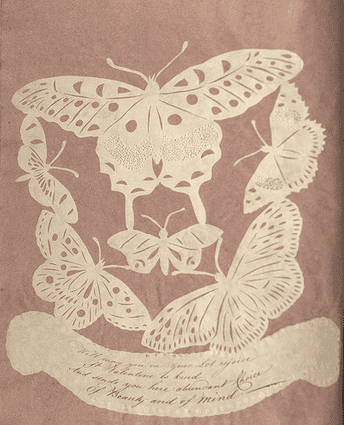 Photo: handmade Valentine Day’s Card, c. 1820. Courtesy of Special Collections of The Johns Hopkins University. 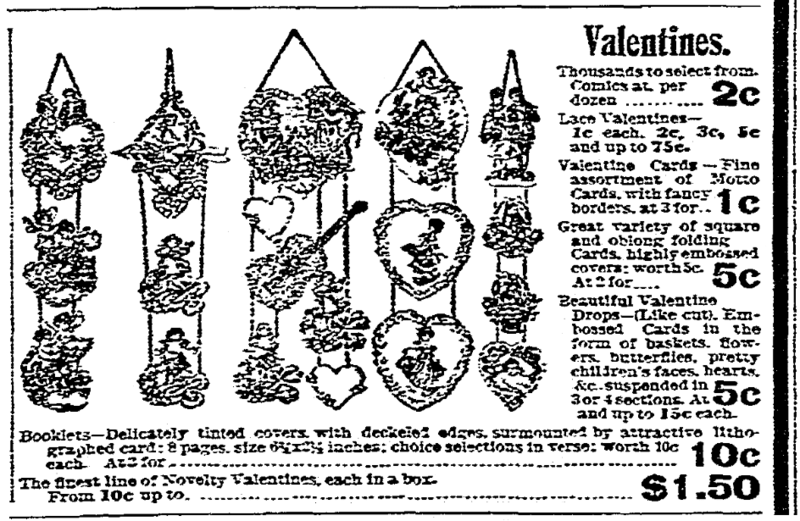 The 20th century provided not only advertisements for Valentine’s Day cards, but also a range of prices and types described in advertisements – like this 1903 newspaper advertisement for valentines that are lace or embossed “in the form of baskets, flowers, butterflies, pretty children’s faces, hearts…” Valentine’s Day cards of this era would have cost your ancestor anywhere from 1 cent to $1.50 – which would be almost $40 today! It’s not surprising that printed Valentine’s Day cards and the images they depict change with the times. Popular culture is fleeting and Valentine’s Day cards often depict what is in style, including media characters and quotes. 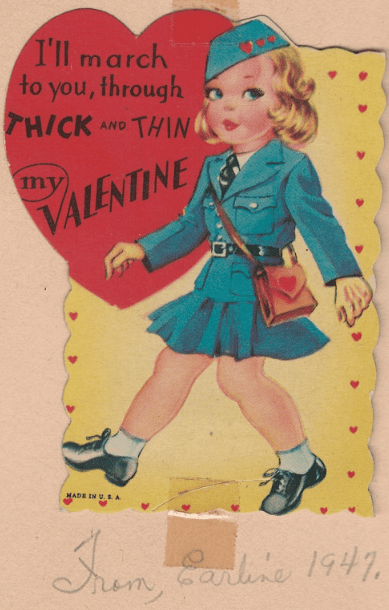 These 1940s valentines given to a teacher by her students include a woman in a military-style uniform that might be reminiscent of the WACs or WAVES (Women’s Army Corp and the Women Accepted for Volunteer Emergency Service) and other women who went to war during this time. While I remember Valentine ’s Day cards decorated with Holly Hobby and animal characters, my guess is that my 10-year-old nephew might be passing out cards with more contemporary themes from movies like Star Wars and Transformers. Do you have a favorite Valentine’s Day memory? Have you saved a card from years gone by? I’d love to hear about it in the comments section below. 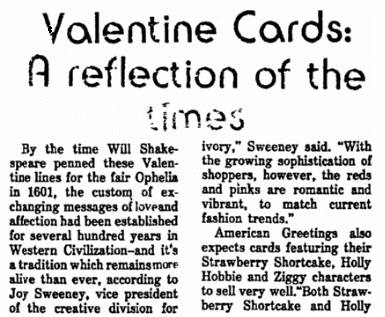 * “History of Valentine’s Day,” History (http://www.history.com/topics/valentines-day/history-of-valentines-day: accessed 8 February 2018). 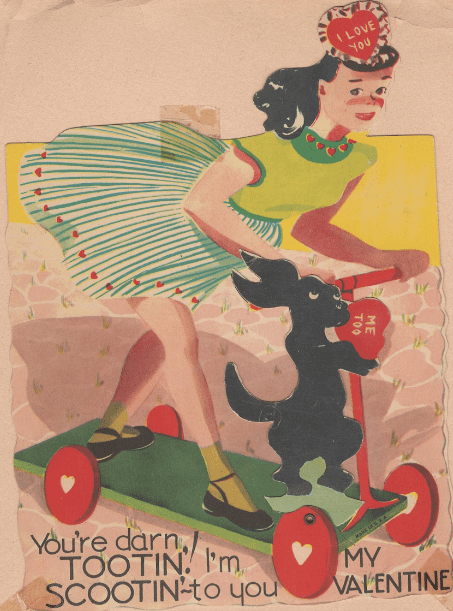 ** “V is for Valentines,” Suffolk Record Office (https://www.suffolkarchives.co.uk/places/a-z-of-suffolk/v-is-for-valentines/: accessed 8 February 2018). Book Burning in Stamford, Connecticut, in 1904?